There's a new king in Westeros; Tommen officially receives his crown. Cersei catches him exchanging looks with Margaery and makes her way over to where Margaery is watching the coronation. Cersei asks her if she still mourns Joffrey and admits her son was a monster. Margaery pretends she hasn't given any thought to still becoming queen by marrying Tommen; honey, you're such a liar. The Meereen party discusses Joffrey's death and what their next move should be. Westeros is vulnerable with a boy king on the throne, but Daenerys has more pressing, local problems. The masters of Yunkai have retaken the city, and the council that was established in Astapor has been overthrown. Mormont suggests she take Westeros now, but she vows to re-liberate Slaver's Bay first. Littlefinger and Sansa, using the alias Alayne, make their way to the Eyrie in the Vale. Guess who's returned to the show this week after a long absence? It's crazy Lysa Arryn, Catelyn Stark's sister! Lysa wants to marry Littlefinger now, now, now now! She also reveals that it was she, under Littlefinger's orders, who killed her own husband, Jon Arryn, Hand of the King to Robert Baratheon. Littlefinger looks thrilled to be marrying her, by which I mean he doesn't. Stay away from the Moon Door, Sansa. Lord Tywin and Cersei discuss plans for Tommen to marry Margaery and Cersei to marry Loras Tyrell. What? She's suddenly cool with both marriages after vehemently opposing them? I don't understand this Cersei. Father and daughter also talk about how the Crown is broke, with the gold under Casterly Rock having been tapped out a while ago. The Lannisters need to maintain their alliance with the Tyrells for economic reasons above all else before the bank of Braavos comes looking for the money that's owed them. So much for the Lannisters paying their debts! Arya is performing her nightly recital of the names of the people she's going to kill. The Hound is totally on board with his brother, The Mountain, meeting his end. The last name on Arya's list? The Hound. Lysa is acting all nice and aunt-ly to Sansa when the conversation suddenly turns to why Littlefinger is so concerned about Sansa. Lady Arryn, soon to be Lady Baelish, freaks out and apparently still isn't over her husband-to-be loving Catelyn. 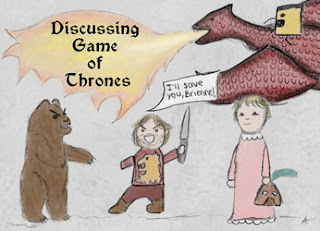 Pod is doing his best to be a squire to Brienne, but he burns dinner and Brienne isn't too impressed with his skills. She even tries to release him from his oath. The Hound mocks Arya's sword skills and goads her into trying to stab him. Unfortunately, he's wearing armor, and she ends up getting knocked to the ground. Cersei questions Oberyn about Myrcella. He assures her that her daughter is doing well in Dorne. Cersei asks him to bring Myrcella a gift since she missed her name day. Poor Pod is still struggling to actually be a squire in the traditional sense. When Brienne asks him what exactly he did as Tyrion's squire, he recalls killing the Kingsguard who tried to kill Tyrion during the Battle of the Blackwater. Bran, Hodor, and the Reeds are still captives of the Night's Watch gone bad. Jojen tells Bran he has to find the tree from his dreams. Meanwhile, Jon and his group of volunteers have arrived to serve up some justice. Locke, who scouted Craster's Keep and spotted Bran and the others, lies to Jon and tells him they need to avoid the place where they're being held because there are hounds there. The Night's Watch attacks and during the melee, Locke tries to kidnap Bran. Bran wargs into Hodor and kills Locke, who finally gets what he deserves. Bran spots Jon and they're thisclose to one another, but Jojen convinces him to continue searching for the three-eyed raven. I kind of wanted to punch Jojen because seriously, he stopped a family reunion. Jon fights Karl and puts Longclaw right through the back of his head. Ghost gets Rast! At least there's one reunion in this episode: Jon and Ghost! Jon offers Craster's wives a place at Castle Black, but they don't want that and burn Craster's Keep to the ground. Yara Greyjoy tries to rescue Theon; Tyrion stands trial. Lady Arryn and Baelish's sexcapade was yukky and funny at the same time, my son was telling me she's real ugly in the books so I get why she's so keen on getting bedded... still yukky... so pissed off at Bran. The least he could do is say HI to Jon Snow!? The dude brought the cavalry, what about a simple thank you instead of just running off again? !